Although mammography remains a key imaging method for the early detection and screening of breast cancer, the overall accuracy of this test remains low. 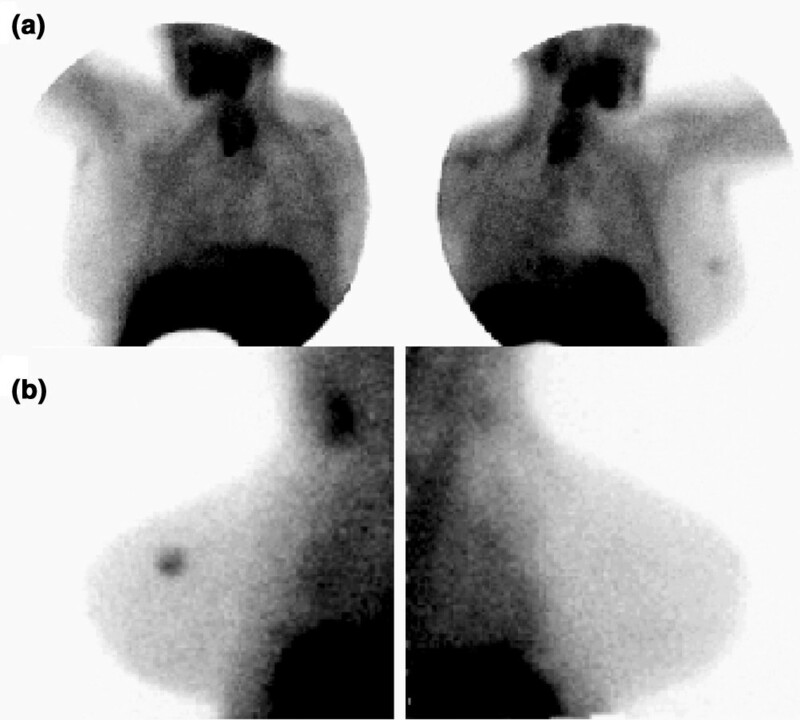 Several radiopharmaceuticals have been proposed as adjunct imaging methods to characterize breast masses by single-photon-emission computed tomography (SPECT) and positron-emission tomography (PET). Useful in characterizing indeterminate palpable masses and in the detection of axillary metastases, these techniques are insufficiently sensitive to detect subcentimetric tumor deposits. Their role in staging nodal involvement of the axillary areas therefore currently remains limited. Several enzymes and receptors have been targeted for imaging breast cancers with PET. [18F]Fluorodeoxyglucose is particularly useful in the detection and staging of recurrent breast cancer and in assessing the response to chemotherapy. Several other ligands targeting proliferative activity, protein synthesis, and hormone and cell-membrane receptors may complement this approach by providing unique information about biological characteristics of breast cancer across primary and metastatic tumor sites. Early diagnosis remains the best method of improving the odds of curing breast cancer. Among the tools currently widely available, screening mammography has been credited with an earlier diagnosis and a decreased risk of death from breast cancer. However, false negatives occur frequently, particularly when imaging post-surgical recurrence, fibrocystic breast disease and dense breast tissue in younger women . Mammography also has a low positive predictive value, and accurate second-line imaging methods are useful in some instances to reduce the number of unnecessary excisional biopsies. The presence of lymph node spread is determined by axillary dissection, a diagnostic surgical procedure that can significantly impair the quality of life of many women. The less invasive sentinel node biopsy may not always detect axillary involvement because the sentinel nodes can be bypassed in 3 to 7% of cases [2–5]. Nodal metastases can also occur in internal mammary or mediastinal nodal groups, which are usually not sampled in conventional surgical staging. Multiple imaging studies are often prescribed to exclude the presence of bone, liver and lung metastases. Despite some progress arising from increased public awareness and screening programs that have tended to improve the stage at which breast cancers are detected, the rate of recurrence remains significant. In 2005, the death : case ratio for breast cancer in Canada has been estimated to be 0.24 . Efficient imaging techniques are warranted for the accurate assessment of recurrent and metastatic disease. The preferred treatment will often be proposed by oncologists on the basis of the integration of several factors, such as the tumor pathologic grade, the age of the patients, the presence or absence of estrogen receptors (ERs) and the site of recurrence [7–9]. To validate whether the treatments are appropriate, the disease burden often needs to be assessed before and after treatment. Among the various imaging techniques used to assess primary or recurrent breast cancer, radionuclide imaging techniques such as planar scintigraphy, single-photon-emission computed tomography (SPECT) and positron-emission tomography (PET) can provide an accurate assessment of the presence and extent of disease as well as unique information about tumor biological characteristics such as the rate of proliferation and metabolic activity. Planar scintigraphy has been used in nuclear medicine for over 40 years and is widely available across hospitals worldwide. This technique consists of injecting a radiopharmaceutical, typically labeled with technetium-99m (99mTc), into a patient, followed by planar imaging with a conventional gamma camera. SPECT images are three-dimensional reconstructions of rotating planar images acquired over a 180° or 360° arc around the patient. Typical radiopharmaceuticals used in planar imaging and SPECT for breast cancer imaging include 99mTc-diphosphonates (for bone scans), [201Tl]thallium chloride, 99mTc-tetrofosmin and 99mTc-methoxyisobutylisonitrile (99mTc-MIBI; 99mTc-sestamibi). PET is an imaging technique that permits the detection of annihilation photons produced by the disintegration of positron-emitting radioisotopes. Typical radioisotopes used in PET imaging are oxygen-15, nitrogen-13, carbon-11 and fluorine-18. In the past few years, the use of PET imaging in oncology has grown rapidly, with the development of several ligands for cancer detection such as [18F]fluorodeoxyglucose (18F-FDG) , 3'-deoxy-3'-[18F]fluorothymidine (18F-FLT)  and 16α-[18F]fluoro-17β-estradiol (18F-FES) . PET imaging requires expensive equipment and a supply of short-lived isotopes. 18F-FDG, the most commonly used radiopharmaceutical, is now widely available in most urban centers. There has been considerable progress in PET equipment technology over the past few years. New systems now commercialized offer an integrated computed tomography (CT) scanner for simultaneous PET and CT (PET/CT) imaging to combine the sensitivity of PET imaging with the anatomical localization capabilities of CT. Positron-emission mammography (PEM) devices are dedicated high-resolution instruments that may have value in detecting primary breast cancer. Over the last several years, many clinical studies in the medical literature have shown that 99mTc-MIBI, normally used for myocardial perfusion imaging, concentrates in breast cancers (Fig. 1) . This uptake is due to an increase in blood flow, number of mitochondria and cancer cell membrane hyperpolarization in the tumor and as a function of the expression of the multidrug resistance gene [14–17]. Since FDA approval, 99mTc-MIBI scintimammography (SMM) has been used clinically to evaluate patients with a palpable breast abnormality when mammography is negative or indeterminate. For optimal imaging, patients are placed in prone position over a special table with a lateral cut-off or a foam cushion with the breast hanging freely. The breast is not compressed as part of the procedure. In a recent meta-analysis summarizing studies from 5,340 patients, the overall aggregated sensitivity and specificity of SMM in detecting a palpable primary breast cancer were, respectively, 85.2% and 86.6% . For non-palpable breast lesions, the sensitivity and specificity of SMM were 66.8% and 86.9%, respectively. SMM and 18F-FDG-PET have similar sensitivities and specificities in detecting primary breast cancers . In benign disease, 18F-FDG and 99mTc-MIBI did not localize fibrocystic lesions, but could falsely identify fibroadenomas as cancer. Globally, the diagnostic accuracies of planar SMM and SPECT SMM  were equivalent to that of 18F-FDG-PET for the detection of primary breast cancer. For the detection of lymph node metastases of the axilla, 18F-FDG was more sensitive than planar SMM (sensitivity 36 to 84%, specificity 86 to 100% [19–21]) and SPECT SMM, in which sensitivity in some studies seemed to be superior to that of planar imaging (sensitivity 37.5 to 84.2%, specificity 91% [19, 22]). Statistically, SPECT-SMM did not significantly improve the diagnostic accuracy over planar SMM. Neither 18F-FDG-PET, SPECT SMM nor planar SMM are sufficiently sensitive to rule out axillary lymph node metastases. For that purpose, axillary dissection or sentinel lymph node biopsy remain the best available techniques. In a more recent study, Cwikla and colleagues cautioned that SMM should be interpreted in combination with mammography to produce more accurate results than either modality alone (combined results: sensitivity 92%, specificity 80%, positive predictive value 89% and negative predictive value 86%; SMM: 87%, 65%, 81% and 75%; mammography: 69%, 72%, 81% and 57%, respectively) . 99mTc-MIBI SMM could not be used for the routine evaluation of all microcalcifications detected by mammography (sensitivity 58%, specificity 81%); SMM was more often positive in high-grade than in low-grade or intermediate-grade ductal carcinoma in situ . SMM was also proposed as a complementary study for evaluating younger patients (less than 50 years old) with dense breasts, even when mammography was negative, because 60% of those cases could be genuinely positive under SMM . SMM should not be used to exclude malignancy whenever histopathological clarification of a suspicious lesion is necessary . When SMM is positive, a biopsy is necessary because a high proportion of these lesions will prove to be cancerous. Although fewer biopsies may be required, the percentage of positive biopsies should increase, leading to a more cost-effective approach to core needle biopsy. SMM has also been used to assess tumor response to treatment. Mankoff and colleagues reported that 99mTc-MIBI imaging could accurately assess the response to neoadjuvant chemotherapy in patients with locally advanced breast carcinoma . The assessment of response to treatment (5-fluorouracil, epirubicin and cyclophosphamide) was accurate only after completion of neoadjuvant chemotherapy. SMM was unable to predict the response after one cycle . A positive 99mTc-MIBI scan was highly predictive of the presence of significant residual disease on completion of chemotherapy . However, a negative 99mTc-MIBI scan could not rule out the presence of considerable residual tumor. Whereas ultrasound and clinical assessment underestimated the response to chemotherapy, 99mTc-MIBI imaging tended to overestimate the response . High primary breast tumor 99mTc-MIBI uptake after neoadjuvant chemotherapy predicted poor survival, suggesting that serial 99mTc-MIBI imaging could provide a useful quantitative surrogate endpoint for neoadjuvant chemotherapy . Finally, 99mTc-MIBI SMM was useful to determine P-glycoprotein and multidrug resistance-related protein expression in patients with breast cancers, and therefore could predict resistance to further chemotherapy . The detection of recurrent breast cancer by mammography is a challenging task because architectural changes, mainly fibrosis and scarring secondary to surgery and radiotherapy, cause difficulties in the interpretation of mammograms. In a prospective trial  performed in the year 2000 to assess the accuracy of 99mTc-MIBI SMM in women with suspected recurrent breast cancer in the breast and/or locoregional tissues, the sensitivity of SMM was 78% in detecting recurrent disease, compared with 42% for mammography. In addition, SMM identified 63% of axillary lymph nodes with recurrent tumor. SMM is believed to be more accurate than mammography in identifying recurrent disease in the breast and can identify locoregional recurrence outside the breast. PET imaging can capitalize on the excessive utilization of glucose by malignant cells by measuring the uptake of 18F-FDG , a derivative of glucose. 18F-FDG is transported across the cell membrane of malignant cells by the glucose transporters Glut-1 and Glut-3 and then phosphorylated by hexokinase . 18F-FDG-6-phosphate is trapped in tumor cells in proportion to the utilization of glucose . Hypoxia and inflammation contribute in part to the increased retention of 18F-FDG in tumor tissues [36–38]. Avril and colleagues found weak but significant correlations between 18F-FDG uptake and the histological subtype of breast cancers, tumor cell density, microscopic vascular invasion, the expression of Glut-1, the proliferation rate and the number of lymphocytes . Crippa and colleagues noted that lobular carcinomas had a low avidity for 18F-FDG, and that 18F-FDG uptake had no correlation with the thymidine labeling index or the presence of hormone receptors . Many groups have studied the role of 18F-FDG-PET in the evaluation of suspicious breast lesions, with sensitivity values ranging between 80 and 90%, and specificity values between 71 and 95% [41–47]. In a series of 117 patients with primary breast cancer, Schirrmeister and colleagues showed that PET was twice as sensitive as the combination of mammography and ultrasound in detecting multifocal tumor involvement of the breasts and could upstage the disease in some cases . However, like SMM, 18F-FDG is limited by a lower sensitivity in detecting some breast tumors because of their small size, metabolic activity, histological subtype, microscopic tumor growth pattern and proliferation . No correlation was demonstrated between primary tumor size, lymph node status, percentage of tumor cells, presence of inflammatory cells, histopathologic grade, steroid receptor status, expression of glucose receptors Glut-1 and the uptake of FDG by the primary tumor . The value of 18F-FDG-PET was compared with dynamic contrast-enhanced magnetic resonance imaging (MRI) in a small study with a limited number of subjects . No significant differences could be demonstrated between PET and MRI. Although 18F-FDG-PET can be a useful adjunct to mammography in characterizing primary breast tumors, this technique is limited by a low sensitivity to detect small tumors and lobular carcinomas . The lack of evidence to demonstrate clear advantages over other complementary techniques and the high cost of PET imaging has limited the use of this tool in the routine diagnosis of primary breast cancer. PEM has been introduced as a lower-cost, dedicated alternative to PET with a higher spatial resolution designed to detect small primary breast cancers. PEM typically uses two opposite coincident detector heads placed on each side of the breast. These positron detectors can be mounted on a mammographic gantry with or without a stereotactic biopsy unit to permit simultaneous or sequential analysis of the breast. The first clinical PEM case study was published in 1996 and demonstrated visualization of primary breast cancer in vivo within an imaging time of 4 min . The original system had a spatial resolution of 2.8 mm full width at half maximum (FWHM), required a tumor : background ratio uptake of 6:1 to obtain an image of contrast 1.86:1, and was incapable of imaging lesions within 2 cm of the chest wall because of limitations in the field of view . In a study of 14 patients  (10 malignant and 6 benign lesions) using a 10% asymmetry of breast uptake or intense focal uptake as criteria of malignancy, PEM had a sensitivity of 80% and specificity of 100%. In a recent series  among 18 breast lesions (7 malignant and 11 benign), using a threshold of greater than 2.5:1 lesion : background ratio, PEM showed a sensitivity of 86%, a specificity of 91%, and an accuracy of 89%. The only false negative originated from an invasive lobular carcinoma. Since 2000 PEM scanner technology has evolved rapidly, with larger fields of view (15 cm × 20 cm)  as well as improved spatial resolution and count sensitivity. In a study conducted with a new-generation PEM scanner and in which a majority of lesions measured 2.5 cm and less, Rosen and colleagues reported a sensitivity of 86% . Two false positives were identified in this study as fat necrosis. Two ductal adenocarcinomas and one ductal carcinoma in situ between 0.8 and 2.8 cm were not visualized. PEM scanners recently reached a spatial resolution of 1.5 mm FWHM . This might improve the sensitivity of 18F-FDG in detecting very small breast cancers. However, low uptake of 18F-FDG by some breast cancers and abnormal uptake by some inflammatory lesions are unlikely to be resolved with this method. Many articles published between 1996 and 1997 suggested that 18F-FDG-PET could be accurate in detecting axillary nodal metastases, reaching sensitivity values in the range 79 to 100% and specificity values ranging from 66 to 100% [44, 55–57]. A large single-center study by Greco and colleagues, published in 2001, also suggested that PET was highly accurate in staging the axilla, with an overall accuracy of 90% . Several recent studies have somewhat dampened the initial enthusiasm for using PET for this purpose: for example, studies by Fehr and colleagues  and Barranger and colleagues  conducted in clinically node-negative patients both found a sensitivity of only 20% for 18F-FDG-PET compared with sentinel-node biopsy. A recent prospective multicenter study conducted on 360 women with newly diagnosed invasive breast cancer reported values of 61%, 80%, 62% and 79% for sensitivity, specificity and positive and negative predictive values, respectively . 18F-FDG-PET was less sensitive in detecting axillary metastases from lobular carcinoma (sensitivity 25%) than ductal carcinoma (sensitivity 66%). PET was unable to detect axillary metastases in several cases with a limited number of small involved nodes. Lovrics and colleagues published a prospective study in 98 patients with clinical stage I or II breast cancer, and found a sensitivity of 40% with a specificity of 97% . Given the impact of the axillary status on the decision to administer adjuvant chemotherapy, the current data suggest that the predictive accuracy of 18F-FDG-PET is insufficient to recommend this modality for routine use. With clinically suspected recurrences, in addition to a complete history and physical examination, the commonly used restaging tools are radionuclide bone scintigraphy and CT of the chest and abdomen, with MRI being used in selected cases for suspected neurological or bone involvement. The role of imaging studies in this setting is to confirm the recurrence and to assess whether the disease is localized or systemic (Fig. 2a). The presence of visceral metastases is also associated with a poor prognosis, and this may influence the choice of therapy. Several retrospective studies published in recent years suggest that 18F-FDG-PET is an accurate imaging modality for detecting recurrent breast cancer [63–67]. Kamel and colleagues studied 60 consecutive patients with suspected recurrent breast cancer. They found accuracies of 89% and 98% for the detection of local and metastatic recurrences, respectively . In 57 patients, Siggelkow found a sensitivity of 81% and a specificity of 98% for PET imaging . Eubank and colleagues showed that PET was more accurate than CT in detecting involvement in mediastinal and internal mammary nodes . 18FDG-PET may also be useful in distinguishing between radiation-induced and metastatic brachial plexopathy . 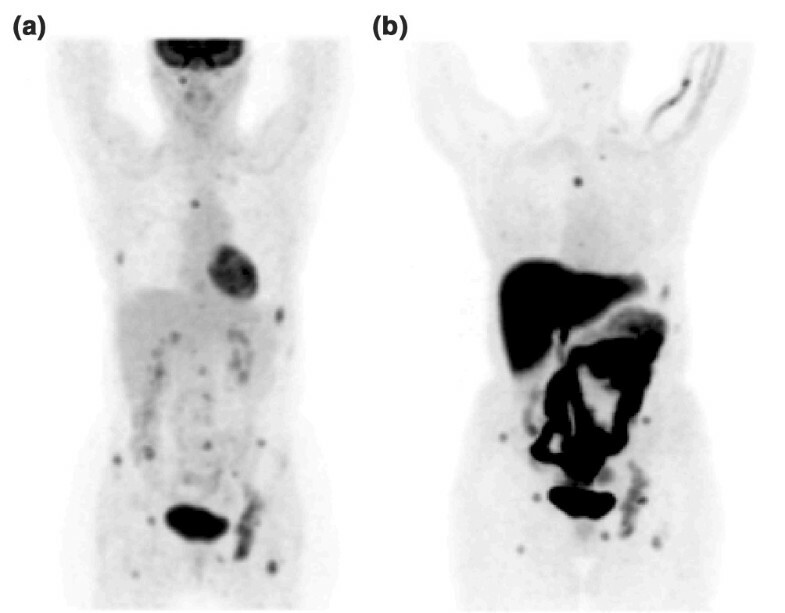 [18F]Fluorodeoxyglucose (18F-FDG) (a) and 16α-[18F]fluoro-17β-estradiol (18F-FES) (b) positron-emission tomography (PET) studies obtained in a patient with newly diagnosed metastatic recurrent breast cancer in the bones. The bone metastases are readily seen in both studies. Whereas 18F-FDG-PET images provide information about the metabolic activity of the metastases, 18F-FES images can demonstrate that the recurrent lesions still express high levels of estrogen receptors. Cook and colleagues compared 18F-FDG-PET imaging with bone scintigraphy to detect bone metastases in 23 patients . They found on average nearly twice as many lesions with PET than with bone scintigraphy, and PET was more sensitive in detecting osteolytic lesions. However, several osteoblastic bone metastases depicted by bone scintigraphy were missed by PET imaging. In 48 patients with suspected bone metastases, Yang and colleagues concluded that 18F-FDG-PET was as sensitive as the bone scan but more specific for the detection of bone metastases . PET imaging has also been proposed as an alternative for the rapid assessment of tumor response to chemotherapy: a reduction in 18F-FDG uptake has been postulated to predict the eventual clinical or pathological response [73, 74]. Wahl and colleagues studied 11 patients with locally advanced breast cancer, treated with hormone chemotherapy . They observed a significant decrease in 18F-FDG uptake in responders after one cycle of chemotherapy and no significant decrease in non-responders. Smith and colleagues studied 30 patients with large primary tumors or locally advanced disease treated with neoadjuvant chemotherapy. After one cycle of chemotherapy, a reduction of 18F-FDG had a high sensitivity for the prediction of a complete pathologic response . Similar results were reported by Schelling and colleagues after the first and second courses of chemotherapy in 22 patients . Mankoff studied tumor blood flow and glucose metabolism by PET to assess whether these parameters are predictive of the response to chemotherapy in locally advanced breast cancer . They found that tumors with high 18F-FDG uptake had a poorer response to chemotherapy. Patients with a low uptake rate of FDG associated with increased blood flow in their tumors were more likely to experience a complete response. 18F-FDG-PET has also been evaluated as a tool with which to monitor the response of breast cancer bone metastases to therapy. Preliminary results by Stafford and colleagues showed a correlation of changes in FDG uptake after therapy with the overall clinical assessment . Results also showed a strong correlation between the change in FDG uptake by bone metastases and the percentage of change in tumor marker CA 27.29. A few groups have developed radiopharmaceuticals for the assessment of ERs, including radio-iodinated ligands for scintigraphy, and fluorinated ligands for PET imaging . Ribeiro-Barras and colleagues demonstrated that 17α-[123I]iodovinyl-11β-methoxyestradiol (MIVE) scintigraphy could be used in patients to assess the presence of the estrogen receptor (ER) in primary and metastatic breast cancers . Using a more selective stereoisomer, Nachar and colleagues showed that the uptake of MIVE on scintigraphy correlated well with in vitro results of ER concentration . Bennink and colleagues, in a study with 23 subjects, showed that patients with high initial uptake of MIVE and complete blockage of MIVE incorporation after initiation of treatment with tamoxifen had a significantly longer progression-free interval than those with low uptake of the tracer and partial or incomplete blockage under therapy . A series of several radiofluorinated estrogen ligands were developed by Katzenellenbogen and Welch in St Louis; their most promising compound was 18F-FES (see Fig. 2b). 18F-FES had a high affinity for the ER and a good chemical stability in vivo [83, 84]. Mintun and colleagues showed that 18F-FES uptake could detect ER-positive breast tumors , and could assess ER expression in nodal and distant metastases . Dehdashti and colleagues confirmed the excellent correspondence (88%) between ER status determined by 18F-FES-PET imaging and in vitro results from biopsy samples . Because 18F-FES is rapidly metabolized in the blood, other analogs have been synthesized with fluorine substituents at the 2 and 4 ring positions to resist metabolic inactivation, and with a methoxy group at position 11 to reduce non-specific binding [88, 89]. Derivatives of fulvestrant (Faslodex®; AstraZeneca) have also been labeled to assess the potential response of breast cancers to this pure anti-estrogen , but in vivo results were disappointing . Because the ER status of primary breast tumors is almost always known from a histopathology specimen, 18F-FES and other ER-binding analogs add little to the initial diagnosis of breast cancer. The key potential role of these ligands is to assess recurrent breast cancer in women with a history of an ER-positive primary tumor. ER imaging with PET can confirm the ER positivity of sites that are inaccessible to biopsy and can demonstrate in vivo the heterogeneity of ER expression. Clinical trials are under way to assess whether ER imaging with PET can predict the outcome of first-line or second-line hormone therapy in women with recurrent breast cancer. Mortimer and colleagues reported a study with combined 18F-FDG and 18F-FES imaging for the evaluation of therapy response to tamoxifen in 40 women with breast cancer . A successful response to tamoxifen was associated with ER blockage and a metabolic 'flare' response (increased 18F-FDG uptake) 7 to 10 days after the initiation of tamoxifen. 18F-FLT has been proposed by Shields and colleagues to image tumor proliferation in vivo by PET . Although 18F-FLT is not directly incorporated into DNA and rather reflects thymidine kinase-1 activity, the uptake of this radiotracer has been shown to correlate well with the percentage of cells in S phase . Vesselle and colleagues recently reported that, in 10 patients with non small cell lung cancer, 18F-FLT activity correlated well with Ki-67 staining by immunohistochemistry, which reflects proliferative activity . Thus, 18F-FLT seems to be a promising agent for measuring cellular proliferation and for the early assessment of therapy effectiveness. In a clinical study  evaluating the use of 18F-FLT as a PET tracer for the diagnosis of breast cancer (12 patients: T2 to T4) in comparison with 18F-FDG, 93% of primary tumors demonstrated focally increased 18F-FLT uptake and 88% with histologically proven axillary lymph node metastases showed focally increased uptake of 18F-FLT. In direct comparison with 18F-FDG, the 18F-FLT activity was lower than that of 18F-FDG in most primary tumor sites and axillary lymph node metastases, but tumor contrast was comparable to that of 18F-FDG. This first available study using 18F-FLT as a PET tracer in breast cancer concluded that 18F-FLT-PET seems to be suitable for the diagnosis of primary breast cancer and locoregional metastases, but further studies are required to validate this hypothesis. Various radiolabeled amino acids were developed for breast cancer detection with PET. However, few studies compared these radiopharmaceuticals with other diagnostic methods. Those radiolabeled amino acids studied in breast cancer include L-[18F]α-methyltyrosine , [11C]methionine [96, 97], [18F]fluoroalanine  and [11C]tyrosine . During chemotherapy courses, the uptake of [11C]methionine from metastases decreased in cases of stable or responsive disease and increased in cases of progressive disease . This led the authors to conclude that metabolic changes in radiolabeled amino acid incorporation measured by PET preceded the clinical response. Studies of the distribution of [18F]fluoroalanine in tissue showed that the tumor : tissue ratio increased as a function of time, suggesting that this tracer could be of interest in detecting breast cancer . [11C]Tyrosine seemed to visualize malignant breast tumors as effectively as 18F-FDG, but the visual contrast was better with 18F-FDG. [11C]Tyrosine had a lower uptake in fibrocystic disease than 18F-FDG, which could reduce false-positive studies. No difference in the tumor : non-tumor ratio was found between the two tracers . Sigma receptors (σ) constitute a family of binding sites initially considered as a subtype of opiate receptors, and both subtypes (σ1 and σ2) are expressed in very high concentrations on human breast cancer cell lines . John and colleagues observed high levels of σ1 and σ2 receptors on primary breast tumors from four patients . Healthy breast tissues did not express specific binding for σ receptor ligands. With a monoclonal antibody directed to the σ1 receptor, Simony-Lafontaine and colleagues showed, on tumor specimens from 95 breast cancer patients, a positive correlation between progesterone receptor positivity and the presence of σ1 receptors . John and colleagues initiated the first studies to assess σ ligands for the diagnostic imaging of cancer. They developed several ligands labeled with radioactive iodine for the detection of breast cancer [103–105]. Caveliers and colleagues recently published the first clinical imaging study evaluating a non-selective σ ligand labeled with iodine-123 in patients with breast cancer . Their preliminary results, obtained in 10 patients in planar mode, showed the detection of 8 of 10 breast cancers, despite the limited spatial resolution of planar imaging. No radiotracer uptake was noted in fibrocystic disease or inflammatory adenitis, which can cause false positive results on 18F-FDG-PET studies. Collier and colleagues synthesized a highly selective σ1 ligand labeled with fluorine-18 for PET imaging of σ receptors . Preliminary results for the detection of spontaneous breast tumors occurring in transgenic MMTV mice were promising with 1-(3-[18F]fluoropropyl)-4-(4-cyanophenoxymethyl)-piperidine . Shiue and colleagues reported promising results for imaging human breast tumors implanted in SCID mice with N(N-benzylpiperidine-4-yl)2-[18F]fluorobenzamide [109, 110]. Several other ligands are being evaluated for the molecular characterization of breast cancer: among many others, these include ligands for assessing the HER2/neu status of breast cancers , radiolabeled metalloproteinase inhibitors to measure invasion capacity  and labeled peptides to detect cell surface receptors that are overexpressed in breast cancer cells . The key advantage of PET and SPECT over other imaging methods lies in their ability to measure nanomolar concentrations of cellular receptors or enzymes without saturating the system under study. This allows radiochemists to follow new developments in molecular therapeutics with radiolabeled analogs of potentially therapeutic compounds to provide non-invasive in vivo characterization of breast cancers. Given the highly variable clinical evolution of this disease, such information may eventually serve to individualize the therapeutic approach by providing functional information about the status of a specific receptor or enzyme across tumor sites. Planar scintigraphy, SPECT and PET can each be useful as adjunct imaging methods for detecting and staging primary breast cancer, but they cannot currently replace invasive procedures because of an insufficient sensitivity to detect small (less than 1 cm) tumor deposits. SMM is a useful tool for assessing palpable breast masses in women with dense breasts and for evaluating a suspected recurrence in a treated breast when mammography is equivocal or negative. 18F-FDG-PET imaging can confirm and restage suspected recurrences, and can provide an early assessment of the effectiveness of a new treatment regimen. Other tracers, such as radiolabeled estrogens, amino acids and nucleosides, may be more specific than 18F-FDG; further clinical studies will be of interest for the assessment of their potential roles in the detection of primary breast cancer and the prediction or evaluation of response to therapy. As new molecular targets are identified and new radioligands synthesized for SPECT and PET imaging, this field is likely to expand with selective ligands targeting proteins that are overexpressed in breast cancer cells. The challenge will be to follow these developments with well-designed clinical studies to evaluate their relative usefulness with respect to other invasive procedures and non-invasive imaging modalities. Both authors participated equally in the draft of the manuscript, and read and approved the submitted version.